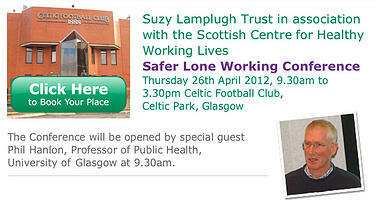 After the hugely successful Belfast event, The Suzy Lamplugh Trust is bringing their Safer Lone Working Conference to Glasgow. The Suzy Lamplugh Trust is the only national charity dedicated to providing practical information and advice about how to reduce the risks of violence and aggression in the work place and their team will be holding their second conference in Glasgow, Scotland on 26th of April dedicated to raising awareness of the risks posed to lone workers. So if you are a lone worker or you manage employees who work alone, and you'd like to know more about the necessary skills, knowledge and procedures required to deal with risk situations facing lone workers, then there is no better event to attend. 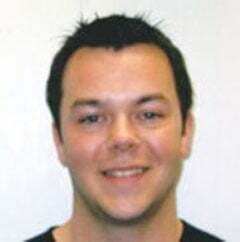 The conference in Glasgow will be opened by Phil Hanlon, Professor of Public Health University of Glasgow and there will be interactive group sessions and engaging workshops hosted by Suzy Lamplugh's highly experienced training staff. NOTE: registration closes 19th of April, so don't miss out and book today!